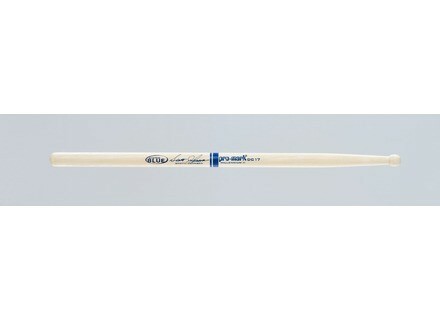 Scott Johnson Autograph Model, Drum Stick from Pro-Mark. Pro-Mark introduces two new models from marching icon Scott Johnson of the Blue Devils. The Scott Johnson Autograph Model (TXDC17W) is made of American hickory. It is 17” long x .700” in diameter with a medium taper and modified ball-shaped wood tip… for a wide dynamic range and responsive rebound. Suggested retail price is $17.00 per pair. The Scott Johnson “Sco-Jo” Practice Stick (TXXB3) is also made of American hickory. It is 17” long x .700” in diameter with a medium taper and modified ball-shaped rubber tip. It’s designed for practice on virtually any surface, but also produces a muted, yet articulate, sound from marching snare or tenor drums, according to the company. Suggested retail price is $29.95 per pair. Both the TXDC17W and the TXXB3 ‘ScoJo’ are in stock and available for immediate shipment. For more information, visit www.promark.com. [NAMM] Pro-Mark Stick Rapp Pro-Mark has added another contemporary color to its line of Stick Rapp. [NAMM] Inked by Evans Gift Card Evans Drumheads announces the Inked by Evans gift card, to give a drummer a custom bass drumhead. [NAMM] Evans System Blue Marching Tenor Heads Evans announces the new System Blue Marching Tenor Heads with Sound Shaping Technology.